Last week I observed sudden hike in thermal gauge, Initial investigation showed that the radiator water level was bit low, though I used radiator coolant I used bit water to top up the fluid level. The same day again same over heating issue and water in the radiator was far lesser than what it suppose to be. I was suspecting the radiator and found no leak in it. Rushed to the mechanic and he said there is a leak in water pump and it requires attention. 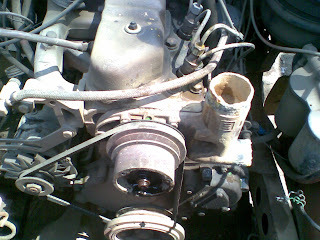 I got a brand new TVS Autolec water pump who incidentally the OE suppliers for Mahindra Vehicles. 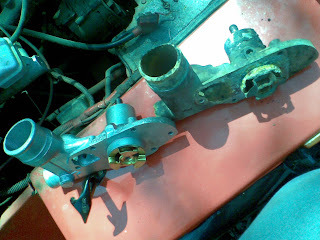 Today we corrected the water pump issue by replacing with the newly acquired one. It was in a shocking state when we saw the water pump and most of the water pump body was damaged with corrosion and barely any metal wall was left over. 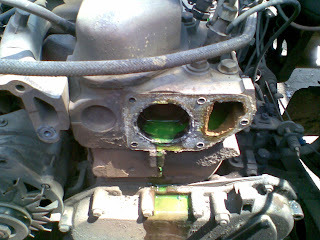 Picture of engine block after removal of the old pump. Just for your comparison purpose here is the old and new water pumps next to each other. 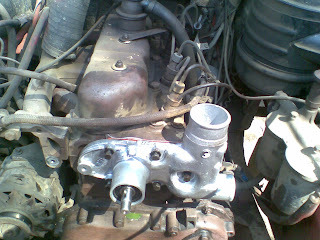 This picture shows the engine with newly installed water pump. Along with today's service, I did change the rear half gate handle, bit of house keeping work for the music system setup and Air-filter intake air hose. I got some hint from fellow visitor and my references to the mechanic that the distinct sound from my Jeep may be from the Diesel pump nozzle and he urged me to check up before conducting any Engine work. 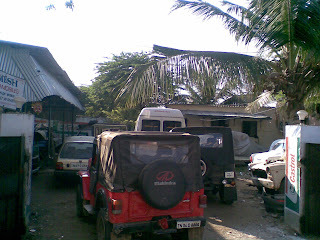 This is the first day I saw all the four friendly Jeeps came together to the garage, except Mad-Bull Ram who's jeep is parked next to my jeep in the above picture we three had a little chat on jeeps. 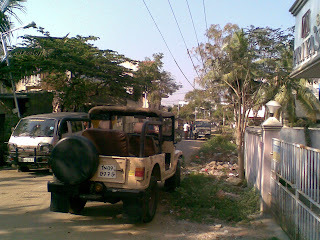 The two jeeps in the above picture are Vinod's and Samy's precious vehicles.